Mummy what can I say to make you happy? I love you with all my heart". This was how my 4 year old handled me during a bad day with post natal depression last week. At the time I was crying, sad, couldn't get up from the sofa. I was so lethargic. Anything and everything was making me upset and I had no strength or motivation in me. My husband's attempts at helping me failed. Everything was failing. Then Eva came along and uttered those words. As she stroked my face and cuddled me, I realised what an impact my illness was having on my children. I felt awful. Here was my 4 year old girl who's supposed to be my baby, the one I care for, the one I nurture and protect, looking after me. It's supposed to be the other way around. I am supposed to be the one to tell her everything is going to be ok, to stroke her hair and face and cuddle her until she stops crying. It was the first time I realised that my illness was having an affect on my girls. It's funny when I sit back and think of it now, there are times when what I would class as bad behaviour, now just seems to be attention seeking or playing up as a direct result of my illness. I realised that on my deepest darkest days, all the girls have ever wanted from me is love, affection, playfulness and overall my attention. When you're suffered with PND or any form of depression, decision making becomes overwhelming. This often leads to me being very indecisive or just giving up. This may have been effecting Eva's own decision making and problem solving. When I ask her to do things i'm often met with a response of I don't want to or lots of crying or lots of stalling. Therefore, just mirroring what she has seen me do over the last year and a half. I've always put her mood swings down to her age but I am now worried that again she is just copying my behaviour. I'd like to think it was an age thing rather than have the guilt of knowing it could be from me. Seeing how she behaved towards me that day was bittersweet. Part of me was overwhelmed and astounded by how much of a caring, sweet girl Eva had become. I was blown away by how grown up she seemed. However, that is the saddest part about it. She is 4. She shouldn't have to be dealing with things like this. She shouldn't have to take a mother role on. I know things won't always be like this. In fact the majority of days are now filled with laughter and happiness. But when they're not Eva this is what I want to say to you. And that it will get better soon." Aww it definitely shows how mhch your little girl cares about u. Depression is hard and u have to make sure u take care of yourself. I can't be so hard and feels like things won't change but they do. I really struggled with my first and it took a good two years before things become right again but it does in the end and kids are so resilient and Eva knows how much you love her! Aww how sweet are her little words. Take care of yourself. There will be a light at the end of the tunnel. Sending lots of love. 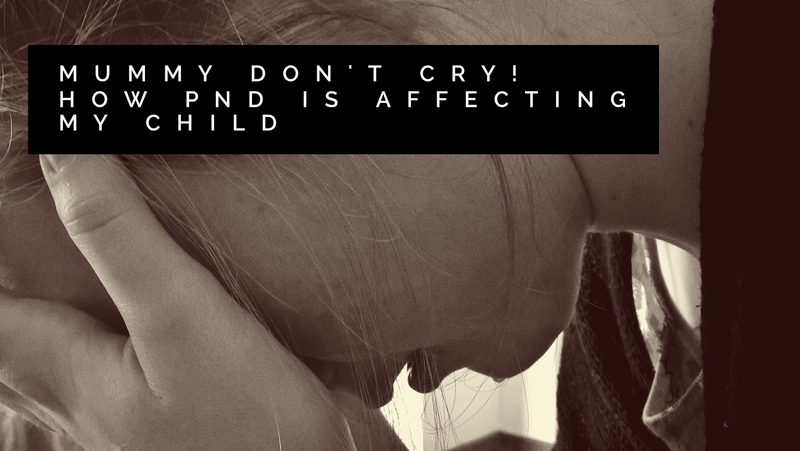 I have never dealt with PND myself but I am sending you lots of virtual hugs. It sounds tough going. You have got a little sweetheart. I'm so sorry to hear your havng such an awful time of it with PND. I think your words for Eva at the end are absolutely perfect, so uplifting. You might be in a dark place but you have light in you! Eva sounds like such a lovely and caring little girl. You are doing an amazing job obviously. I do understand this. I love your poetry and I think it's really brave to speak out about this subject for sharing. What a lovely post. Your daughter sounds very caring. A very personal and moving post. How beautiful your daughter's words are. You are a wonderful Mother, and there is the proof. It does get easier, I promise you. But I know those words aren't the biggest help. Keep those good days to mind, and remind yourself that you're allowed to have your down moments, you're allowed to need time, and please don't feel guilty on any level for having to go through this. Such a beautiful and brave post darling - just remember whatever happens you are all the mum your daughter needs. How lovely that you have a record of this so that when your little girl is older she can look back and read your account. That's very precious. That's beautiful! And say those words to her, it will mean so much.